Outdoor Recreation NI is delighted to be delivering the ‘Flow – Get Into Watersports’, a new national campaign with the aim of getting more people into watersports. Northern Irish Olympian, James Espey took time out of his busy training schedule to launch ‘Flow’. The 32 year old Bangor man competed at the London 2012 Olympic Games in the Men’s Laser Class and is currently working hard to qualify for this year’s Olympic Games in Rio in August. Having taken up the sport from an early age at his local yacht club in Ballyholme, where he still trains, it is clear that he has lived and breathed the sport for many years however he firmly believes watersports can be taken up at any age. 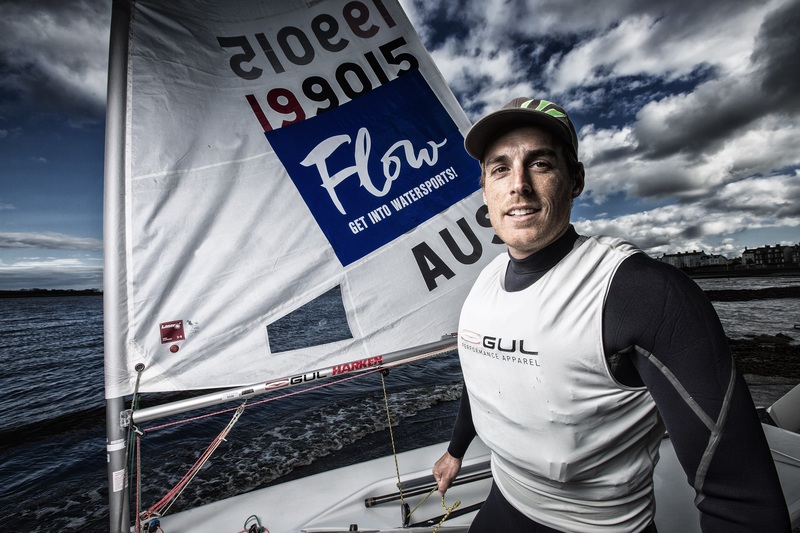 “Both my parents were the driving force behind my early days in sailing however this new Flow campaign is absolutely ideal for those with no background in watersports whatsoever. To learn the basics of watersports with other like-minded folks under the watchful eye of qualified instructors and to be able to continue this development throughout the rest of the year, will be a fantastic introduction for anyone wanting to get into water based activities across Northern Ireland”, James commented. ‘Flow – Get into Watersports’ is co-funded by The Erasmus Plus programme of the European Union and is a partnership between Sport Northern Ireland and a range of water based National Governing Bodies with the aim of getting more people into watersports in the lead up to the European Week of Sport in September. The campaign kicks off with a weekend of water based activity taster events organised by watersport clubs during the weekend of 14th and 15th May. These events will be closely followed by a series of follow up training events to encourage people to continue in their chosen activity. So even if you can’t attend the taster events you can still get involved by taking part in one of the follow up events that are taking place. During the taster weekend there will be a range of clubs based on waterways all over Northern Ireland including the Lagan, Lough Erne, the Foyle and Belfast Lough offering taster events in canoeing, sailing, water skiing and wake boarding, rowing, angling, stand up paddle boarding and diving. The cost of these taster events are being offered at a lower price in order to make them accessible to everyone. Visit www.FlowNI.com to see a full list of taster events and follow up training events that are being offered as part of the campaign to get you flowing into your next adventure! Further information on Outdoor Recreation NI’s role is detailed here.